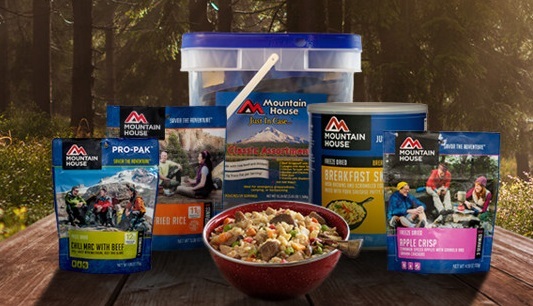 FINAL 24 HOURS: Mountain House Food up to 46% off; Milk and Butter Package up to 32% off! Just saw this: "Is 2016 the Worst Year in History?" The answer is no, but to even have to ask that question in a major media site indicates that the age of modern crisis preparedness is upon us. Safecastle is here for you and has been for almost 15 years now, offering the best quality preps at the greatest value pricing. Current examples ... well, please have a look at our member email outlining the HUGE July specials that are expiring tomorrow, July 31. Final days: 45%-off Mountain House freeze-dried Ground Beef (plus many more) -- 30-yr shelf life! Safecastle's current Mountain House Sale prices are expiring July 31. Selected varieties are steeply discounted, such as a huge 45% off freeze dried Cooked Ground Beef! By the way, Mountain House this week officially updated their product shelf life guarantee to 30 years for both #10 cans and pouches, retroactive to all foods produced in the last 30 years! Mountain House Cans & Pouches Now Rated at 30 Years Shelf Life! Valid Real-World Testing Proves MH is the Best! What's more, this change is retroactive to all MH foods purchased in the last 30 years, regardless of what may be imprinted on those cans and pouches! Just in time for the end of our July Mountain House Sale--up to 46% off!! 2. And the Lifestraw Steel--your choice of 1, 2, or 3 packs. 3. Now adding practical options, we've paired both those Lifestraw models with stainless steel bottles that the Lifestraws fit into perfectly for storage, transport, and practical ease of use in the field. Every once in a while we try to reach out to the folks who need a little extra help in their efforts to get the best prepping deals out there. 1. Add the membership to your shopping cart. 2. As you checkout, use this code in the coupon field: SAVEme and follow thru the checkout process, making sure you click on "Place Your Order" at the end. 3. Be patient as we need to manually activate your membership. When you receive an email that says "Membership Completed," you are good to login and join 10,000 other serious, like-minded folks who are comfortably building their "cache savings." BIG Discounts: Eggs, Meats, Berkeys, more! 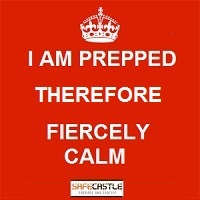 Prepare & Fortify with Safecastle's huge discounts on hundreds of preps. ... for anyone old enough to recall an America of peace, prosperity, and liberty ... when bad guys were recognized and punished ... and good guys were, well, the good guys were us and we didn't have to try to make a case for that fact or apologize. Today's norm? ... Fear of traffic stops, regularly scheduled "Days of Rage," open season on law enforcement, sanctioned racial warfare, overturning of natural laws, and the judicial denigration of the Bill of Rights. Many of us saw this coming, though it is still shocking to see it come to fruition the way it has. It's why Safecastle came about and why we have grown and we continue to provide what is possibly going to save countless lives in the not too distant future. Stay safe! Current Production - By the Can or Case! This is a first for us ... we've been waiting a long time to get our hands on freeze dried salmon fillets. Your discount? ... up to 13% with FREE shipping! This is current production ... manufacture date of June 1, 2016. Plan on a shelf life of 25+ years. 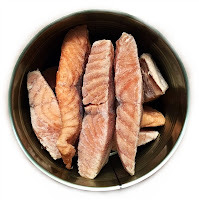 10 salmon fillets per can. They average about 3-7 inches long and 2-3 inches wide and each fillet is the perfect serving size for a big eater. Oh man, oh man, oh man, oh man - Salmon! JULY: Select Mountain House Varieties Up to 45% Off! Mountain House just surprised us with a very steep discount on five select 30-year-can varieties for the month of July. A couple of these discounts are as low as I can recall for even just a single case of freeze-dried MH! Buyers club members have additional MH discounts. Of course it all ships FREE.